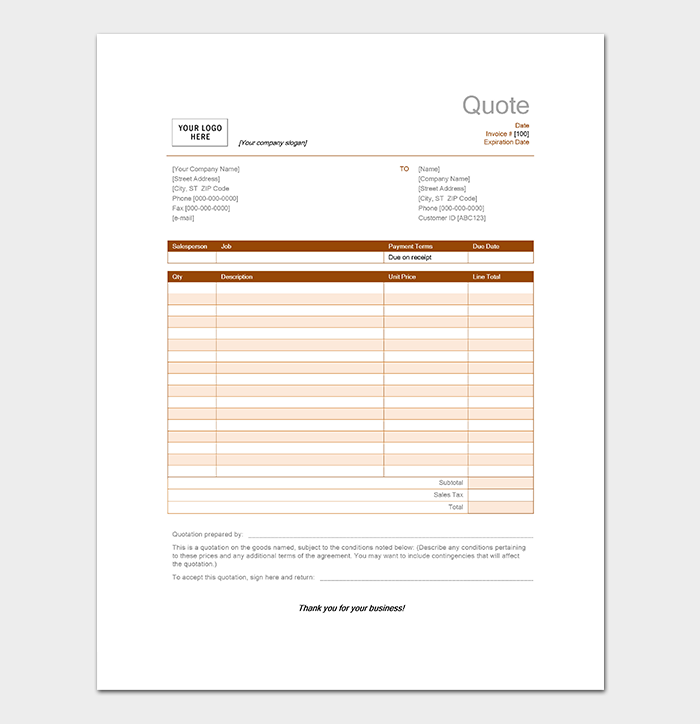 In business, a quote is a document which companies provide to prospective clients. 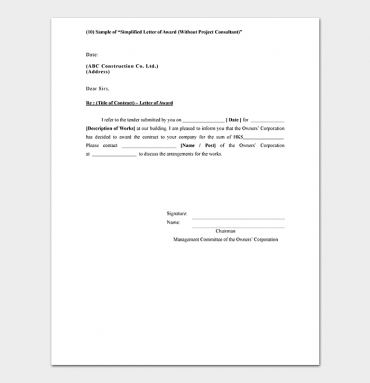 This document will outline or ‘quote’ the costs involved in the project. Costs can include everything from labor costs, supplies, materials as well as service costs. A client approaches a company regarding their project and requests a quote. Often, these clients collect many such quotes before making their final decision. It is not uncommon for a client who likes the price quotes of one company, but the business practices of another, to ask a company to match or beat the prices of their competitor. Sales quotes, price quotes, construction quotes, bid quotes, home repair quotes, automobile repair quotes and many others. What to Include in a Price Quote? Company’s Contact Information: This includes the full name and address of the company, plus contact information such as phone, FAX, and email. This is usually placed at the top left hand side of the form. Customer’s Contact Information: The customers full name, company (if applicable) and address. Include phone number(s), FAX and email accounts. Date: This is the date the quote was given. Quote Number: This is the identification number for this particular quote. This is necessary for keeping track of your customer transactions and is used to file the paper version of the quote, as well as input it into an invoice system tracking system. This information can then be used by sales, supply companies, or the accounting office. Valid Until Date: This date refers the date that the prices and terms present in the document are valid to. Prepared by: Use this field to input information regarding the sales person who prepared the price quotes. This should include the full name, as well as contact information. This is useful in case the client has questions or concerns. Description: This section will vary from invoice to invoice, depending on the type of project. It can include labor, supplies, and part numbers, etc. Quantity: Place the quantity of each item ordered here. Unit Price: This is the price per one unit of the item listed in the description. Amount: This is where you place the amount of each unit of each item in the description. If there is more than one unit requested, be sure you note that. For instance, if they ordered 3 pairs of shoes at a unit price of 6.00 each, the total amount would be 18.00. Terms and Conditions: Again, this section will vary from transaction to transaction. It should have payment terms, along with any other condition of sale, such as refund information. As this quote can be used as a legal document, once the deal is set, give them a space in this section for their handwritten signature. Totals: This section contains the total of the items listed in the price quote document. This includes the subtotal, tax rate, discounts, and any other fees which part of the transaction are. As you can see, sales or price quotes contain information which is necessary to secure important clients, as well as help to build client trust and a solid business rapport. Keep in mind that this is also a legal document once it is signed, so it is imperative it includes information from prices to fees, discounts and payment terms. Price Quote Templates are a convenient, quick, and easy way to customize and keep track of these important transactions. Our Quotation Templates are designed to give your client valuable information regarding the transaction, but to help you achieve a professional appearance. 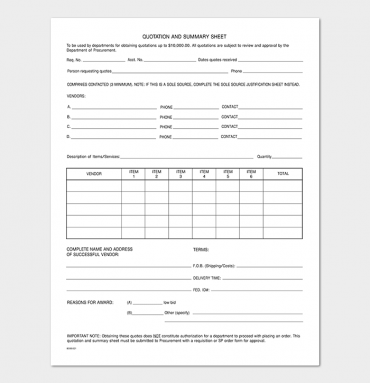 Each quotation template will include fields for all the pertinent information you require. Once you download your quotation template, you are free to customize the template in Excel to meet your specific needs. 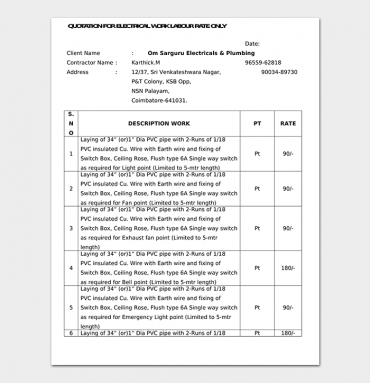 We guarantee that our templates will provide you with a cost effective and time saving method of storing, customizing and printing your quotation templates.